Gladys Pak Lei Chong. 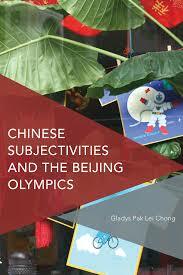 Chinese Subjectivities and the Beijing Olympics. London/New York: Rowman and Littlefield, 2017). vii, 283 pp. ISBN 978-1-78660-009-7 (PB), £29.95/$44.95. Chinese Subjectivities and the Beijing Olympics is a sociological study of the way in which various actors, including the Chinese state, the population at large, and geopolitical forces combined to produce a shared understanding of the Beijing Olympics in 2008, and to drive engagement, accommodation, and resistance among Chinese citizens. Closely following the work of Michel Foucault, Gladys Pak Lei Chong examines the usefulness of famous concepts such as disciplinary power, biopower, and governmentality in deciphering how the Chinese population participated in the Olympics, and the meaning of their engagement. Chong’s data comes from interviews with taxi drivers, volunteers, and others who worked on the Olympics in different capacities. She also studied TV productions and the Internet presence of anything concerning the Olympics, as well as texts, advertisements, posters, photos, and other promotional materials, all collected or examined in four fieldwork trips to China and Hong Kong. At the core of her study is the ethnographic observation of participants, observers, and interlocutors of the Beijing Olympics. Chong has divided her chapters according to case studies. The first (Chapter 2) looks at the modern history of sports in a China struggling under invasion and working through the cultural changes of modernity. Strong bodies were required for national rejuvenation, and moving away from the “sick man” image and modernizing the image of women were two aspects of “bodily restylization” (43). Chong discusses the life story of Zhang Boling, who was the founder of Nankai University and enthusiastically promoted physical education. This account is important because it was one of several retold in an Olympics-related exhibition. A few early women athletes also are part of this history. Yang Xiuqiong, who participated in the 1936 Berlin Olympics, was known as the beautiful mermaid. Her willingness to appear in a swimsuit, along with her attractive and pleasantly outgoing personality, marked her as a modern woman. Famous athletes such as Li Ning and Lang Ping appeared after the 30-year Cold War hiatus, competing in the 1984 Los Angeles Olympics. Chong traces the gendering of athletes, where the male athletes needed only to be good to be popular, but the female athletes were popular only if they were beautiful. She also notes that strong male bodies seem to be necessary icons in the struggle for equity with the West, countering traditional preference for the unmuscular, refined man. This analysis could have been strengthened through consideration of the work of Kaja Silverman, especially in Male Subjectivity at the Margins (1992), her pioneering study of how modern societies invest male subjects with symbolic leadership qualities unavailable to most women. Chapter 3 focuses on the volunteers that were recruited to help with the games, with interviews and study of the guidelines they were given. The recruitment of volunteers was part of an enormous effort to prepare Beijing for visitors, and included training in projecting a positive image through friendly interaction based on positive emotions. The volunteer work was presented as desirable, and many more applied than could be accepted, suggesting that the campaign was successful. The population was engaged rather than coerced, and many found the opportunity attractive for a variety of reasons, including nationalistic sentiment, the excitement of having an opportunity to see and be part of a global spectacle, and simple camaraderie. As part of the effort to project a strong and peaceful nation, the Olympic volunteers were recruited primarily among young, attractive people with English skills. In addition to being trained in how to behave, the volunteers also could be shamed, Chong states: they were warned that losing face could be a national issue. She places volunteerism broadly within governmental efforts to promote engagement, and the development of non-governmental organizations, which have helped in earthquake relief efforts. Overall, Chong shows how the crafting of volunteers occurs at many levels of society, from personal to familial to national. Chapter 4 zeroes in on Beijing taxi drivers, who were required to go through language and behavioral training to address the influx of foreigners. Since most taxi drivers did not have a good education to start with, it was a challenge to get them to attend English language courses, and many complained. Because their behavior, communication skills, and even personal hygiene (as well as the cleanliness of their cars) was a source of concern for organizing committees, however, taxi drivers were subjected to re-education and required to meet certain levels of preparedness. Whereas most drivers agreed that raising suzhi (human quality) was important, others resisted the campaigns in many ways, minimizing their learning of English, sleeping in their cars, and modifying the dress code. The English test for drivers—which they were required to pass before they could drive during the Olympics—initially had a high failure rate. Eventually, however, it seems as if everyone passed, suggesting that both the authorities and the drivers were conscious of the limitations of the re-education project. In both the learning of English and the behavioral modifications, there seems to have been a discrepancy between what was officially mandated and what was finally deemed acceptable. In Chapter 5, the emphasis is on top-down formation of subjectivity, with the state seizing the moment to address the new Beijing, China, and Chineseness. Through the lens of “Temporizing Space and Time,” the chapter’s subtitle, Chong looks at official strategies to shape collective perception of history, the city of Beijing, and the united effort to put on the Olympics. She argues that the organizers worked through three “temporalities” that emphasized several aspects of the past, present, and future (138). Roughly, these are, (1) the historical and new Beijing, (2) the substitution of an old history with a new one, and (3) the future of the city. The first effort revolved around the new Qianmen, which was redesigned with Chinese cultural symbols and icons. The result, however, was not entirely successful, as Chong describes a theme-park atmosphere in the old urban area. The Olympic Green became an emblematic site through which the new Beijing could be visualized, Chong argues. It suggested modernity, progress, and open-mindedness. And the future—imagined as the turning of Beijing into a cultural city, an international metropolis, a national capital, and a livable city—became clear in the short film New Beijing. Again, the result is “rather mechanical” and “lacking in human presence,” according to Chong (149). She mentions that the stunning architecture of the Bird’s Nest, which was praised by a number of the interviewees, also contributed to the sense of a future Beijing. Hong Kong is at the center of Chapter 6, with a focus on the technologies of government and the re-Sinification of Hong Kong subjects. To engage the Hong Kong community in the Olympics, several programs and media projects were developed. Chong uses the work of Markus Stauff, who takes Foucault’s concept of governmentality and applies it to media, to argue that media can and should be interpreted as a technology of governing. RTHK (Radio Television Hong Kong), Hong Kong’s only public service broadcaster, co-produced programs with the HKSAR (Hong Kong Special Administrative Region) government to produce four programs, the Olympic Highlights and three installments of a series entitled Glamour of Sports. Chong argues that the government used a set of generic discourses to “encourage the population to identify positively with China,” including bringing in popular hosts, referring to China’s rich history, mentioning the idea of “China rising,” and so on (164). At the same time, conscious of the criticism that they were manufacturing consent, and wary of making the media productions appear too indoctrinating, the programs also brought in those who disagreed with the Olympics project, even showing dissent on the street. Chong’s study follows Foucault’s insights very closely, showing how power works as a mesh or fabric with many origins and manifestations. Fundamentally, Chinese Subjectivities and the Beijing Olympics is an application of Foucault’s widely influential approach to rethinking how power works. Chong values Foucault’s work for its rejection of a simplistic top-down model, instead showing how power and knowledge are intertwined at all levels. In her Epilogue, Chong considers the question of whether it is valid to use a Foucaultian approach to analyze the Beijing Olympics. To counter the potential critique that she is slavishly applying Western theory—which apparently has been suggested to her—Chong examines not only the way in which Foucault’s work can help parse Chinese experience, but also how Chinese experience can show what is lacking in Foucault’s theories. Along with other critics of Foucault, Chong argues that bringing out the many forms of resistance to state power will provide a corrective to his theories, which did not adequately address the strategies through which people counter coercion. Yet the kinds of resistance she documents are minor, and surely exist in all or almost all societies as people try to juggle the demands of the state, the law, their work, their families, and more. Whereas Foucault’s work has its limits—among them his assumption that the subject is male—all concrete social contexts can “talk back” to Foucault, for the simple reason that his work, like that of any other social theorist, contributes theoretical insights, not comprehensive coverage. From European feudalism emerged what can be designated Euro-modernism, a cultural form that was let loose on the world and conquered it. In short, it established an empire in the true sense of the word. If you take a look around its predations continue, unabated, putting at risk the entire fate of humanity. Its influence is why we converse in English; why the preponderant worldview is liberalism, not Confucianism, Daoism, Buddhism etc. The world went from multi-civilisational to mono-civilisational to unipolar. Of course, it seems like this uni-polarity is today crumbling and we could be headed towards a multi-polar world order again, but if we are to talk of empire, is this not at least where we should begin? Kho suggests that we are presently locked in a pattern of behavior that dictates our way of thinking and being in the world. It also organizes languages hierarchically: “English remains the universal language, French, the language of diplomacy, most of the prominent languages have been derivatives of Latin etc., and the preponderant worldview is Liberalism. Why? That’s where history comes in.” Although I am not sure that French is still the diplomatic language—and certainly not outside Europe—Kho is roughly correct. This situation will not last forever, of course, but how it will evolve into something different, and whether the future will be better or worse, is unclear. Railing against a white professor who questioned her objectivity, a white PhD student who claimed that Hong Kong has no culture, and any white person praised for speaking a few words of Chinese while her Cantonese-inflected Mandarin is regarded by mainlanders as inferior, Chong ends her book on a sour note. Although I have some sympathy for her anger, there are several problems with her position. One is that she conflates journalists—who have the demands of investigative reporting driving their efforts—and scholars; another is that she is uncritical about the danger of any scholar assuming the position of native informant. And a third is the implication that only ethnically Chinese scholars suffer from discrimination. Certainly scholars of different descent who research China also are regularly assailed by questions about whether their ethnicity prevents them from understanding, and by the suggestion that they should accept without question interpretations provided by those with an authentic claim to the culture—as if that group were unified in its convictions. Even a cursory glance at the wide range of ideas across the spectrum of writing by ethnically Chinese commentators reveals a variety of perspectives, a diversity of which Chong surely is aware. It is unfortunate that under the banner of countering ethnic bias, Chong ends her sociological study by herself falling into a quagmire of uncritical assumptions regarding cultural authenticity, ethnicity, and the right to have a voice. Chinese Subjectivities and the Beijing Olympics is chock full of information and ideas about the Beijing Olympics, all based on years of fieldwork. Chong is balanced in her approach, pointing out positive and negative aspects of the Olympics experience from many perspectives. Her work illustrates the rich applicability of Foucault’s theories in the modern social world, and shows how a massive global spectacle can produce a complex mix of engagement and resistance.